My favourite toy when I was a child was a rag doll that my Mum made me for my 4th birthday. She came complete with a wardrobe of clothing made to match some of my own dresses. Pollyanna was very well-loved and I have still have her today. There is something wonderful about rag dolls – they are a lot more cuddly and have more personality than the plastic dolls available today. When Sarah was young, I loved making clothing, accessories and bedding for her dolls. If you love rag dolls as much as we do, you will love My Rag Doll, 11 Adorable Rag Dolls to Sew with Clothes and Accessories by Corinne Crasbercu. It is a sweet book that includes sewing patterns to make up a delightful collection of rag dolls, all with their own fun clothing and accessories. Corinne Crasbercu is the author of Everything Patchwork (that we reviewed here), is a designer and stylist for Marie Claire Idees (one of our favourite crafty magazines), and has worked as a costumer for film and television. She has is an experienced dressmaker and has assembled a lovely collection of rag dolls. They are all made from the same basic doll pattern – the hair and facial expressions change, and the size gets enlarged to make a wonderful collection of dolls – each with their own distinct personality. What we love most about the book, apart from the delightful photography and styling, is the wide range of clothes and accessories that you can create. The ballerina doll has a tutu, underskirt, tiara, leotard, shrug, ballet slippers, and barrel bag. The attention to detail is amazing. The Bedtime Doll has a nightdress, dressing gown, teddy, mules, and cushion. The dolls are so enchanting and would be perfect to encourage imaginative play in young children. The book comes complete with pattern pieces to make all the dolls and accessories. Most of the pattern pieces need to be enlarged and seam allowances do need to be added as instructed. The directions are clear but there are no step by step photos or diagrams. The book is best suited to intermediate sewers with some experience. The good thing about making rag dolls and their clothing is that they can be made from recycled fabrics – such as old sheets, clothing, etc. You can add scraps of lace and trim, buttons and other embellishments to make each outfit unique. I was inspired to make a Kimono dress from the book. The instructions were easy to follow and I sewed the kimono in under an hour. 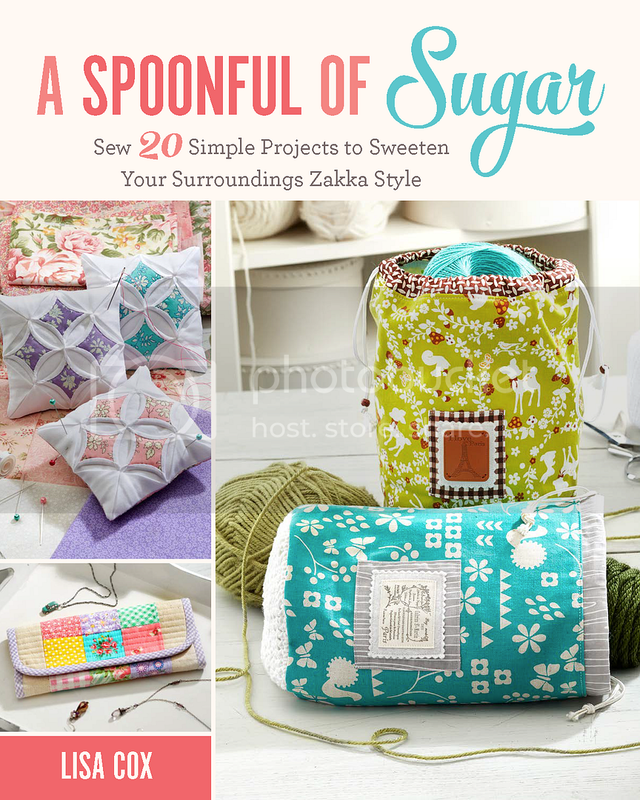 Thanks to Stitch Craft Create, one lucky A Spoonful of Sugar reader will win a copy of My Rag Doll by Corinne Crasbercu. To enter, log in to the rafflecopter giveaway box below and do as many of the giveaway steps as you wish. The giveaway is open worldwide and Stitch Craft Create will ship the prize to the winner. The book is due to hit the shelves in May. Giveaway ends 24 April 2014 at midnight, Perth time. Winner will be announced here and by email on April 25. Good Luck! Check out the other stops on the Blog Book Tour to see more of the book and for more opportunities to win. Disclaimer: Thanks to Stitch Craft Create for supplying us with a review copy of the book. All opinions are our own. I loved making dolls clothes when I was little, mainly for my Barbie doll. I am now hoping to have a little granddaughter one day to make dolls and dolls clothes for her. This book looks delightful and I’d love to own a copy! I would make them for my two little girls. My Grandaughter would love one of these and since I am now teaching her to use the sewing machine she might even be able to make one of her own. Teaching your grand daughter to sew must be so much fun! I would make a rag doll for expected little sister. I have four nieces all of whom would love a rag doll! I have four nieces. All of whom would love a rag doll! Oh, one grand daughter in particular will love a rag doll, especially the Princess ballerina- what a great combination. Sienna will take her for walks in the doll pusher, tuck her into the doll cradle and take out the little bag of baby doll accessories Grandma has and give that rag doll a bottle and a dummy! So sweet! I’d love to make one of these dolls for my 2 year old grand daughter. She would love to have clothes and accessories to play with as well. thanks for the chance to win! I would make 2 little rag dolls for 2 special little girls at church. I adore them and they always share a hug when we meet on Sunday! My littlest would love this, love that you can make a whole wardrobe for your doll! I would make a rag doll each for my beautiful grandchildren who live in the UK, especially as we see them rarely. They would be something very personal and special for them to cuddle and play with. Is there a granny doll in the book?? Such beautiful patterns. I would make a rag doll for my mum, seeing as she always made me beautiful things when i was a child. I could repay the favour a little! First I would make dolls for my two 4yo granddaughter’s. they would love them with all the extra things to make. Then I’d have to make some to leave at my house. Also have some other sweet little girls that would love some! What fun! Would love to make a doll for my niece! I would love to make one for my cousin’s new baby girl. My daughters, niece and friends with kids! I have a granddaughter I would love to make these cute dolls for! I would make rag dolls for my 2 daughters and for myself. 🙂 Thanks for the giveaway! Myself! I have a small collection of beautiful dolls and she’d be added to the family. I would like to make it for my daughter! For me ^^ Everything is sweet and sweet things are for me *lach* Or a little boy for my Son for his third birthday perhaps? I don’t have anyone specific to make one for but I want to make one. Like others my sewing journey started by making clothes for my own dolls on my gran’s treadle singer. My niece Paige needs a companion, I think, and one of these sweet dolls would be lovely company. I would like to make them for my daughter! Ciao, mi piacerebbe fare queste stupende bambole per le mie nipotine, quando mia figlia era piccola le ho fatto una bambolina (molto semplice) che ancora ha e tiene per ricordo! Gorgeous book! I’d make a doll for my baby niece, with dresses to match the dresses I make her. I would make a rag doll for myself! 😀 Always wanted to have one, but always had the half-plastic boring ones, with only one cloth. I would love to make rag dolls for all of my nieces and nephews. I know it sounds weird, but I’d make a doll for me. One that has my skin colour, my type of hair. My African features. All the black dolls I saw as I was growing up were basically the same white doll, dipped in brown paint and had straight hair. It confused me as a child. I had a rag doll that I loved and my Granny made me all kinds of adorable softies. I like the look of this book and would definitely customise the patterns to further represent other skin colours and other ethic features. Sorry didn’t intend post to be so controversial. It’s a craft blog – not a political soapbox ! Lol ! Thank you for opening this worldwide, it is rare. Would love to make a doll for my nieces!!! Any girl would love to have a doll like this. What a lovely book! I love making dolls & softies for my 2 girls. The wonderful thing about making your own dolls is that you can customise them. I would make rag dolls for my two little nieces. I would make one for my daughter and one for her best friend. I would probably also end up making one for my best friends little girls too. I love to sew and I love making dolls that will be loved and dragged around and cuddled until they are dirty! I would make rag dolls for my each of my three granddaughters. I have been searching for a really good rag doll book….this fits the bill! …..a boy doll for my grandson! Hi Pat – I checked the book and it doesn’t mention washing instructions. I had rag dolls as child and mine were always hand washed in a mild soap and dried flat in the shade. Thanks for this giveaway, this book seems to be really great. I take this opportunity to thank you for all that you share on your blog, it is one of my favorite since a long long time. Hi from Paris – France. I love rag dolls. Reminds me of the one I had when I was little. Wow – a beautiful book – that really gives what it intends to – Many patterns for rag dolls – Love it!! My grand daughter, who loves dolls. Rag dolls are at the top of her favorite list. and I just love that these have the cutest as accessories. My daughter is a nurse in a Children’s Hospital, I think I would be making dolls for some of the patients! I was very young when I learned how to sew. I think the first things I had ever sewn was doll clothes. My mother taught me how to sew just as her mother had taught her. I had a rag doll with pitch black hair and a red dress… she always reminded me of snow white. I love the dolls in this book. The designs and wardrobe look so well thought out! I would make one for my little niece. I would make these for my niece. My grand mother made rag dolls for my sister and I as kids and wejust loved them. We had matching dresses, I remember her using old clothing and even pieces of burlap. Just whats needed for my three great nieces. Thanks for the chance. Isabella – my great niece! I would make for my niece and my best friends little girl – thanks! I would make a rag doll for myself but I might give it away to some sweet young child too. I would make one for my niece. Her birthday is coming up and I will have time to make her a doll and a few outfits. This book looks AWESOME! I’d love to make a few of them! Forgot to answer question. I have two nephews that I’d make them for. Myself. I never had the joy of owning a rag doll as a child. The doll is so cute. I would make one for my 4 year old granddaughter. I would like to make the rag doll and all the trimmings for my granddaughter for Christmas. My husband is planning to make a wooden high chair and cradle, so we need to get busy now to get it all done. Thanks for such a lovely giveaway. If I had girls, I would definitely make these dolls. They are gorgeous! I would love to make one for myself. It’s been a lot of years since I’ve had my own doll! I would make a rag doll for my friend, Linda who could do with a cuddly companion right now. Probably for me as well. I love making dolls. My two daughters would adore little rag dolls! Hope I win this one. My two daughters would adore little rag dolls! I would love to make a doll for my daughter! For my two wonderful daughter’s, of course. One is 9 and the other 2 but they both would adore these rag dolls! These are absolutely adorable! <3 I'm not sure who exactly I'd make a doll for, but I love making doll dresses for friends and family. I would make them for my friend’s sweet daughter! Well there would be one for my niece, one for my friends daughter and then I bet my own daughter would put in her order complete with wardrobe and accessories!! I have three nieces, and every one of them would love a rag doll made by me. I would love to make dolls with my girls. My niece is about to turn 1 and she loves dolls. Looking for a doll for her birthday was not successful so I thought I’d make one. This book looks perfect! As she gets older, I could give her more outfits and accessories. I would make them for my 2 daughters and, time permitting, 6 nieces! I imagine it could become highly addictive!! I would love to make one (or more) of these doll for my granddaughter. She loves to play with dolls, and these are adorable! I would love this book! I purchased Corinne’s book ‘Poupees en chiffon’ years ago with the intention of making a best friend for my little girl (she was only a baby at the time). I have tried translating it though (its all in French) and I just cant get it right. An English version would be so helpful!!! My niece…although I’m sure her kitten will commandeer it as soon as its left alone in her room. That kitten attaches itself to everything! I would make a doll with my daughter. And one for my niece. And two for my other nieces……. OK, I’m convinced I need this book. Thanks for the great giveaway. Thanks for the chance, this looks like a simply gorgeous book! We made a toy for a Toy Society drop a few years ago – so much fun … and such a great cause. I love the dolls, but I especially love the clothes and accessories. I’m 61, and I still play with dolls, so I can imagine the fun my little great nieces would have with these dolls and all of their clothes and shoes and good stuff! I’d make a doll for my youngest niece, who is about to turn two! I think she’d love carrying it around and changing its clothes (actually, having Mom or one of her adoring brothers do the work). I’d love to make a doll for both my kids, and probably also my nieces and nephew. I’d make dolls for all the kids I know! I have three boys but hopefully one day I will have grand daughters. I would make the dolls for them. Thanks for the lovely giveaway. Me gustaría hacer estas preciosas muñecas para mi hija Paula… ¡y alguna para mí! I would make a rag doll for my daughter. I would maybe even make one for myself. 🙂 they look so cute! I would love to make rag dolls for my kiddos and as birthday gifts for their friends. I would love to make the dolls for Grand childres and my great neice but,I can’t find the dam book. Is this for sale in the US if so where? You could ask your local bookseller to order it in for you. Hope you manage to track down a copy. It really is a lovely book. I bought the book yesterday at a JoAnn’s store. I love it and have read it all the way through and can’t wait to make the sweet dolls and their oh so pretty clothes. I do have a question – I did not read anywhere in the book that I need to enlarge the patterns – yet I did read in a comment on the book that it was difficult to copy patterns and enlarge them on a home copier. Do I have to enlarge the patterns and if so by how much? Please email me the answer as I do not want to start making them until I know. This questions pertains to the dolls and their clothes. Thank you so much for your help. It is really a gorgeous book; one that I can look at over and over! I love dolls!!! Hi Maryann – If you read the instructions, it tells you which pattern pieces need to be enlarged and by how mcuh. I have the UK edition though and it may be different in the US version.